Indianapolis Colts head coach Chuck Pagano expects running back Robert Turbin to miss the rest of the season, according to ESPN’s Adam Schefter. Turbin suffered an elbow injury in the team’s Week 6 loss to the Tennessee Titans. Through six games, Turbin played 124 snaps for the Colts and registered a PFF overall grade of 71.8, the highest grade among Colts running backs. He handled 23 of the Colts’ 140 total rushing attempts and racked up 53 yards, 50 of which came after contact. Over recent seasons, Turbin has emerged as one of the NFL’s premier short-yardage backs. 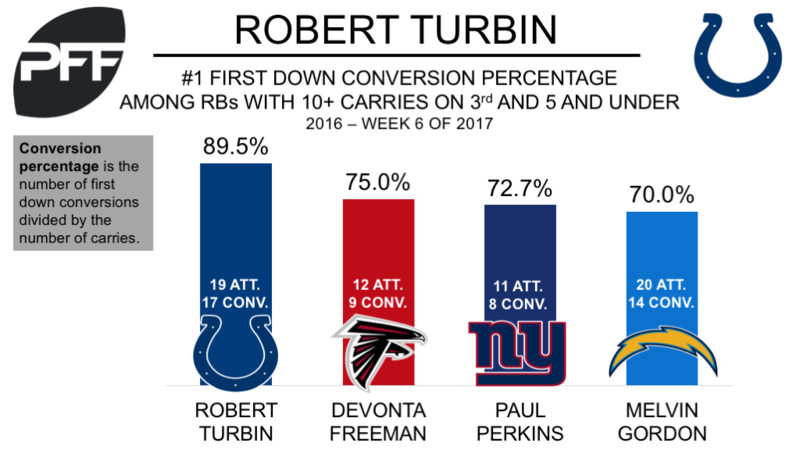 This season alone, Turbin was given the ball eight times on third and five yards or less, and he converted all eight carries to first down. In his time with the Colts (Week 1 of 2016 – Week 6 of 2017) he carried the ball 19 times on third and five or less and converted 89.5% of those carries into a first down, the highest rate among running backs in that span. Turbin’s loss will create more opportunities for promising rookie Marlon Mack, who has looked dangerous with the ball in hands so far this season. Through six games, Mack has carried the ball 27 times and forced eight missed tackles, the most among Colts running backs.